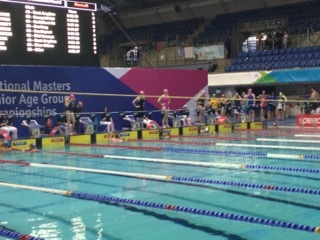 Masters at Reading Swimming Club offers training to all swimmers age 18 years and over. We have around 80 swimmers in our squad and offer up to 6 training sessions a week across a variety of pools in Reading. 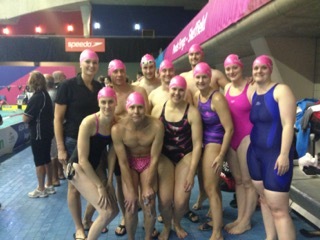 We are a vibrant, fun and welcoming squad, with swimmers of all ages and all abilities. Come along and try a session! Our Masters squad is a mix of many ages and abilities, from 18 to 65+, with several swimmers competing at Masters National and European meets, Open Water events and Triathlons. We currently have the UK's fastest channel swimmer for 2015 in our squad as well as many National finalists and European Top 20 swimmers. Competitive and fitness swimmers train together at a variety of different levels. Masters swimmers generally follow a programme to lead up to the short and long course Masters Nationals and Europeans events, as well as supporting some competitive triathletes and open water swimmers looking to enhance their swimming fitness and performance. 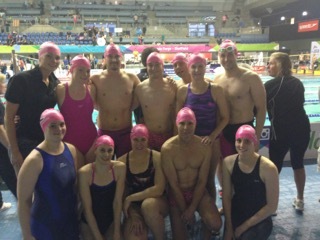 Our squad is also great for fitness swimmers who want the incentive of a regular, motivating training programme. Masters offers the chance to improve your swimming whatever your level, and we welcome all swimmers to join.We also have a regular social calendar and are a friendly, approachable, fun squad. There is a special rate available for swimmers who only wish to swim once a week, otherwise you have the flexibility to chose any session at any time to suit you. It?s up to you how much you swim - the more sessions you can do, the faster and fitter you will become. As a guide, to join the programme, you need to be able to swim continuously for 60 minutes and to be competent in freestyle, backstroke and breaststroke with a willingness to try butterfly! Come along and try a session! You can find out more by emailing Carolyn Fox, the Masters Administrator. Swimmers can choose the number of sessions they wish to swim each week and fees are set accordingly. 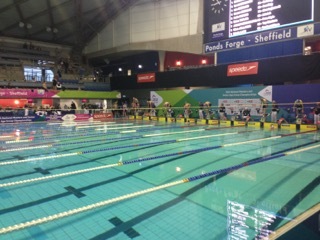 The majority swim between 2 and 3 sessions a week. Click on the Masters/Waterpolo menu (must be logged in) to access past session plans for Reading Masters. By providing these plans we hope to provide a resource for swimmers that have been unable to attend a session and provide some inspiration for individual swim training. If after your trial swim you decide to join the club you need to register as a new member on the club website. The relevant tab can be found on the top left of the home page or click here. You then need to pay the club membership fee and set up a monthly standing order for the swim fee. Once your registration and membership payment have been received you will be registered with the ASA as a Category 2 swimmer allowing you to enter open competitions held under an ASA licence. Monthly fees are £45 to swim at all the sessions or £28 if you only swim once a week. You must pay an annual Masters Club membership fee of £54.99 which covers ASA membership and administration. This is renewable each year. And there is a 'one-off' £20 joining fee payable when you first register. All fees and payments are collected by direct debit. For insurance purposes YOU ARE NOT PERMITTED TO TRAIN WITH THE SQUAD UNTIL YOUR CLUB AND ASA MEMBERSHIPS ARE IN PLACE. You will receive an email informing you when everything is in order and you can then start training. Please wait until you receive the welcome email as you will be turned away from sessions if you do not appear on the current squad list. If you are currently registered with the ASA under another club you may wish to be registered second claim with Reading or hold Reading as your first claim club. We can advise you of the best way forward. Reading Swimming Club was devastated in 2015 by the tragic loss of one of our much loved Masters swimmers, Katie Henderson, in a tragic car accident. Katie was a world class swimmer who set numerous World, European and National Masters records that still stand today. In October 2014 she won 8 medals at the ASA National Masters Championships in Sheffield. She was an incredibly talented and enthusiastic sportswoman who motivated many swimmers in our club. As a tribute to her, each year Masters swimmers award the 'Katie Henderson Cup for Endeavour and Enthusiasm'. Katie's friends and family have also set up a charity fund in her name, which you can find out more about at www.justgiving.com/Katies-legacy.